Whats the deal with all of the Windows updates? Windows Updates whats the deal? Windows updates start time 10:30 pm, I normally work on a Mac computer, but I decided to install Windows Vista on my Mac using Boot Camp so I can test my web sites and make sure everything works between the different browsers and operating systems, but whats the deal with all of the updates I installed the Windows Vista operating system over an hour ago and I am still doing updates as a matter of fact as I am writing this article there are still 49 of 97 updates waiting to complete this is crazy. I guess when your a Mac user you get used to turning on your computer and just working, but it has been so long since I have used the Windows operating system I almost forgot what a pain in the rear it can be. This sure does bring back memories though of a time when I would spend hours on in performing updates, disc defrags, anti virus scans and malware scans. I sure am glad I don’t have to use Windows as my primary operating system I just hope this updating stuff will be done in the next few hours I need to get some sleep. Ok, so its been about 3 hours and I though I was all done with the Windows updates, so I restarted my computer and low and behold 6 more updates. I only have one thing to say about the Windows Operating system and the long process it takes before you can even use it WOW this is crazy. Ok, so I restated after the last 6 updates where finished and now I have 3 more updates I don’t think I will be getting any sleep tonight. I guess my recommendation to anyone thinking about installing the Windows OS try to make sure you have no plans and you start early. I am scared, but I am going to hit the check for updates button. Its checking, still checking, still checking, still checking, still checking, wow what a surprise 15 more important updates. For those who are keeping count I have installed 121 updates and have wasted over 4 hours of my life, and now I am asking myself why did I install Windows on my Mac? Oh yeah to check if my web sites display correct in the different browsers, and guess what there are minor issues in Internet explorer of course, but no problems in Firefox. I think it is strange because on my Mac there are no issues on any of the browsers I use, such as Safari or Firefox. Please respond below if you see any issues on my web site and the browser you are using, and I would greatly appreciate it. Ok so Windows is still downloading the updates I sure hope this is all of them, because I started at 10:30 pm and it is now 2:25 am. Still installing updates 5 of 15, 2:33 am Done time to restart here we go. 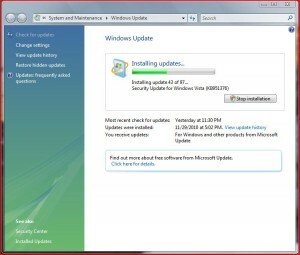 Windows has restarted and its 4:40 am Guess what it says, if you said update your right it says 1 more important update. WOW I just got a pop up window saying the installation for Windows Vista Service Pack 2 might take an hour or more, and your computer might restart several times. You wont be able to use your computer during installation. This is really crazy why do people buy computers with the Windows OS? 2:45 am here we go again, so I have restarted the computer again and the install is complete it actually was not as bad as I thought it was going to be it is 3:10 am, so it did not take the full hour like it said. Now I am doing another check for updates and I swear if it says it needs more updates I give up and I am throwing in the towel, and guess what it came back with 5 more important updates. This is crazy I will have to finish this some other time, because at this rate I will go crazy. Well its 3:13 am and I am throwing in the towel, Windows you have won this round, nut I will be back for more punishment and I hope to one day have a completely updated Windows Vista OS, if that’s even possible. Good Morning it is 10:15 am and I am going to start the update process once again, so I have my windows update window open and it says 7 important updates to be installed lets see how many more will come when these are done. 10:41 am I just got a message saying that Windows Live Essential could not be installed. To try again, click Try Again, Ok lets do it again. I am also currently at install 6 of 7 I sure hope this is the end of the exhausting task. 10:51am same error message again lets try again. 10:56 same error this time I am going to hit close and see what happens. Victory is mine after nearly 180 updates and 5 to 6 hours of my life I have finaly finished the updating task. I feel so accomplished, but at the same time regretful and scared to use the Windows OS we will see what happens. This is not intended to offend any Windows fans this is just my opinion, but I really do love the Mac OS over the Windows OS. Please tell me how you feel about your favorite operating system below.